My first experiences with overwintering were happy accidents. I just ran out of time in the fall and didn't get my gardens cleaned up properly. The following spring I was pleasantly surprised with edible vegetables in the garden! A little research and I learned that you can do this intentionally. There are many vegetables that will store in the garden, and there are some seeds that need a cold spell in order to germinate. When we overwinter some of our garden, we pay attention to these traits and take advantage of them. There are two basic types of vegetables that we overwinter, those that germinate well in the cool spring and the biennials. The vegetables that germinate well in the cool spring are best planted late in the fall. The seeds store in the garden and will sprout as soon as the weather is right in the spring. There aren't that many vegetables like this, but there are a few. 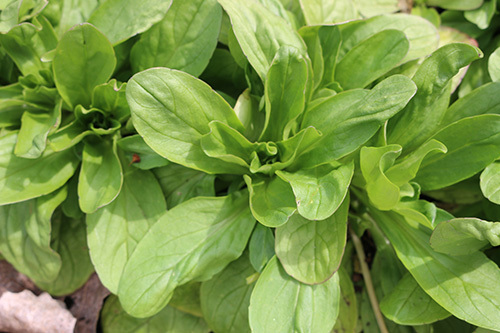 Spinach grows best in the early spring, and I have better luck with it if I plant it in the late fall. It isn't perfect, and I'm lucky to get 50% germination, but it grows so well that I don't mind the loss of some of the seeds. 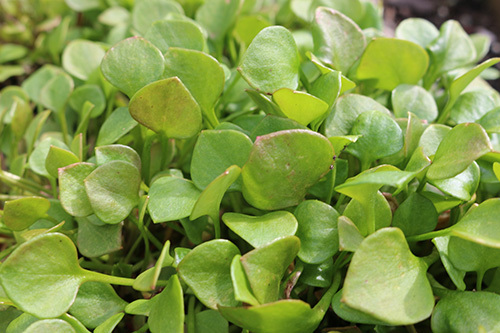 Corn Salad and Claytonia were two that I had a horrible time growing. I planted them last fall and nothing came up, again. But they came up beautifully this spring and we harvested salads in early April, about the time I was planting my lettuce. The main vegetables I overwinter are the biennials. Biennials are plants that require a winter to flower. Typically they do best when started in mid to late summer. They form a root or head, but don't flower that first year. After winter they begin to green up in the spring and send out a flower stalk. Most of us don't even think about how these vegetables form a flower and produce seeds. We grow them for their greens or roots and harvest them long before they flower. They are the roots like carrots, beets, turnips and parsnips as well as the cabbage family like cabbage, broccoli and kale. We are taking advantage of the fact that these vegetables are programmed to survive a winter. The roots are stored in the garden, much like in a cellar. They aren't as fresh as they were in the fall, but they are definitely edible. I find they take longer to cook, and you wouldn't want to eat them raw. But they are delicious and a welcome sight after a winter of frozen and preserved vegetables. 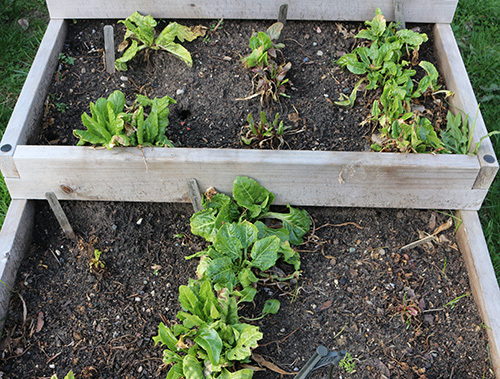 The vegetables that produce greens will begin to grow leaves in the spring. These are wonderful early spring greens and are good to eat until the plant begins to send up a flower stalk. After the plant begins to flower the leaves will become bitter. Now on to the specifics, the details of exactly how to do it. 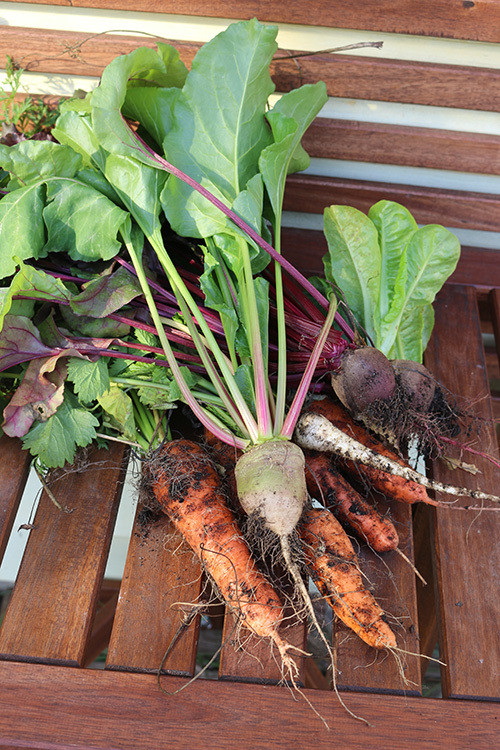 The first group of vegetables that I overwinter are the roots, carrots, beets, turnips and parsnips. They are grown to full size in the fall and stored in the garden over the winter. The root won't get larger in the spring, so you need to do all the growing in the fall. Exactly when to plant depends on your climate. In the north, that is usually late summer to early fall. In the south, this is probably later and the shorter days and less light will probably be the thing that stops the root growth and not the cold temperatures. In colder climates, it is best to cover the plants with mulch in late fall, just before winter sets in. Straw or dry leaves will provide a protective blanket so that the roots don't get so cold that they rot instead of store. In the spring, it is time to harvest the roots. Gently harvest them as soon as the ground can be worked. They will send up a flower stalk, and the root becomes woody and hard and not edible, so harvest early so you get to eat all those vegetables you worked hard to produce. The second group are the biennial greens. I really only do kale and swiss chard this way. 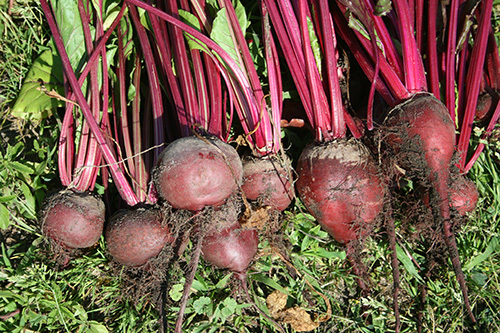 Kale is in the cabbage family and swiss chard is basically a beet green. I usually start them in the spring, harvesting kale and chard all summer. You can start them in late summer if you don't have them already in the ground. And then I just leave them in the garden over the winter. It is best to cover them with some mulch if you live in a place with harsh winters. In the spring they will begin to produce leaves again. These leaves are great until the plant begins to send up a flower stalk. I found the best varieties of swiss chard to overwinter are the white ribbed chards, especially Lucullus. 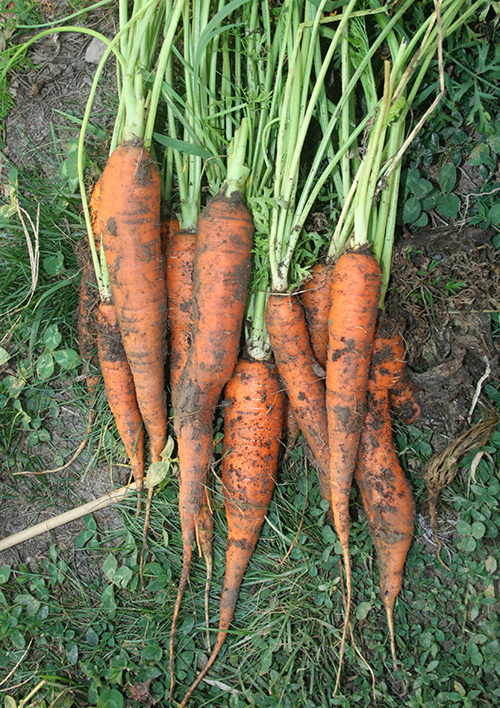 The colored stalk varieties tended to rot more easily instead of overwintering. I've had great luck with Red Russian and White Russian kale and overwintering. They produced well and beautifully in early spring before the cabbage moths were out to destroy them. There are other plants that can overwinter as well. There is a variety of broccoli, Purple Sprouting Broccoli, that doesn't produce broccoli flowers until spring. It must be started in the summer to harvest the next spring. With cabbage, if you leave the base of the plant in the ground after harvesting the head, that base will produce little side shoot cabbages, much like brussels sprouts. In the spring you can harvest these little shoots for a spring cabbage treat. Onions are also biennials, and I find that green onions are great to store in the garden. If your winter is moderate to mild, they store easily and can be harvested in the spring before they flower. I also like to overwinter some lettuce. It is an annual, but can survive a mild to moderate winter. 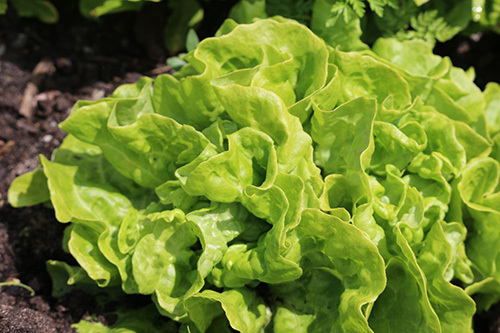 I usually plant some lettuce to overwinter. It isn't a sure thing, but is a welcome sight when it works. I leave some heads in the ground in the fall. Last year I left Tom Thumb Lettuce in the ground and it did really well in the spring. We had several beautiful heads fill out once it thawed.